Pedagogy should be the key driver to transform learning experiences for all students. 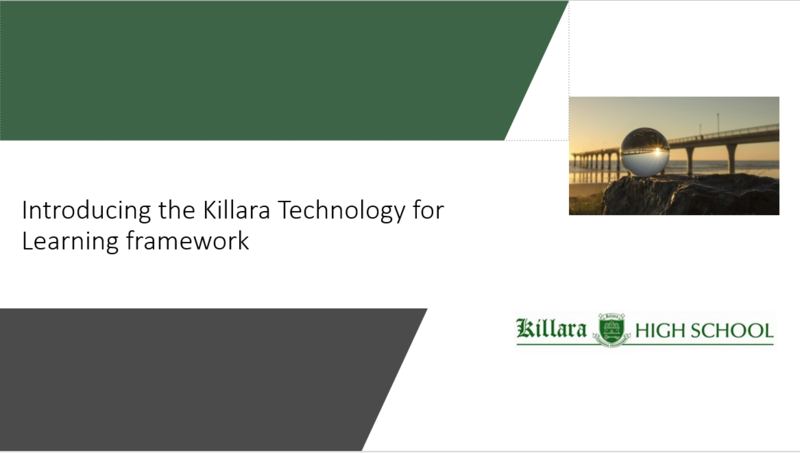 The Killara Technology for Learning Framework is based on current research and best practice. Click here to access the Technology planning matrix. We have exceptional teachers with outstanding ability to transform learning with technology. They are available to talk to you about how you could better use technology in the classroom. ​Assessment in the 21st century should use a range of pedagogical approaches which use formative and summative approaches to allow students to self-assess and draft work based on teacher feedback. Technology aids teachers to gauge student understanding with a level of automation not previously possible without technology. This area we will explore and pedagogical approaches and tools. ​Technology tools allow students with visual, hearing, cognitive, speech and mobility disabilities to access learning in different ways. There is a broad array of assistive tools to help ESL and students with learning difficulties. In this area we will look at tools and approaches to learning to make learning more accesible for all students. ​Learning environments are both physical and virtual and enable student centred learning to foster collaboration at the local and global level. In this area we will learn about a broad range of approaches to use open learning spaces more effectively. Communicating in the 21st century requires students to be able to collaborate and communicate in multi modal ways locally and globally. Technology tools such as blogs, videos, podcasts and cloud-based programs enable different ways to create and express creativity. ​Knowledge construction activities require students to generate ideas and understandings that are new to them. Students can do this through interpretation, analysis, synthesis, or evaluation. In stronger activities, knowledge construction is the main requirement of the learning activity. Technology tools are essential for projects and automating processes so you can get more done in every day. This area you will learn how to maximise workflow with a broad range of productivity tools for educators and students. 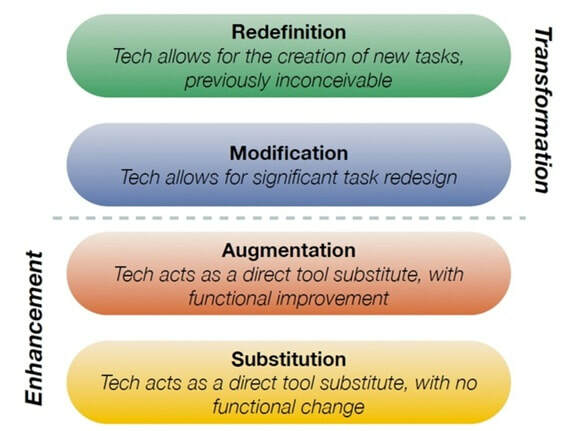 The learning ladders approach uses the SAMR model to show you how you can use pedagogical approaches and tools to drive effective learning with technology to a higher level. ​(be aware these are examples only as there are many different ways to drive pedagogy with particular tools). Be aware these are only used as an example for using driving technology in teaching and learning.